You are currently browsing the tag archive for the ‘playing polo’ tag. I’ve only ever only been to a polo game once. It was at a farm in Greenwich and I believe we went more for the fun of having a picnic with friends than to watch the actually game. If only I had then the full appreciation for the skill of the players that I have now, I would have paid a lot more attention. We were first introduced to the idea of playing polo by our Cork friends that we hung out with in Rio. They said it was terrific fun and the best thing they did in Buenos Aires. 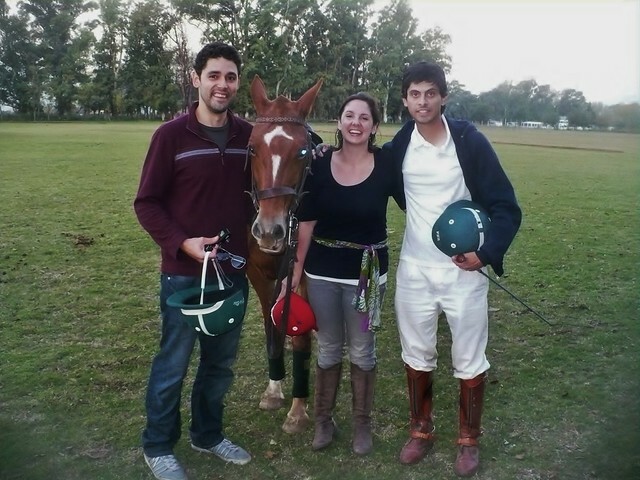 The lessons are run by Fernando Nieto, owner of Polo Elite. It was at the time and still is the Number 1 rated “Thing to Do” on Trip Advisor for Buenos Aires and for good reason. (Trip Advisor has been a saving grace for us on this trip). And obviously since neither Nellu or I have spent any real time on a horse the experience had the potential to yield a bounty of comedic material. Fernando has one of those temperaments perfectly suited to being a teacher. He has a seriousness about his sport but the patience to deal with grown adults who are slightly cocky but also sheepish about being on a horse in the first place. He even took our jokes in stride. (Jokes that we made of course to mask our nervousness about the whole endeavor). The day progressed at a smooth pace. We got an introduction to riding, followed by some time getting used to the horses. (We were on the horses before we really had anytime to get nervous about it.) We then got instruction for how to hit the ball while staying on the horse. It turns out it’s all in the shoulder. Then we took a brief break. During our break, we got to watch Fernando train one of the horses for playing polo. It was great to see what we were supposed to look like. It’s was so elegant. Rider and horse moving so seamlessly together. After our break and snack, we got back on the horses to play our game. Girls against boys with Fernando as the referee (who would occasionally help by guiding the ball into a scoring position). Although we were still clearly newbies, we actually played that game. 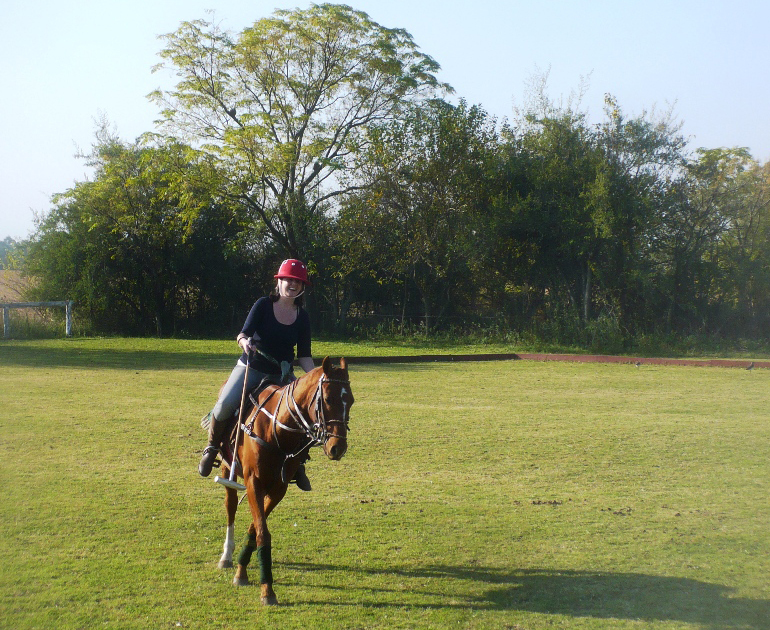 The best moment for me: at one point Frode and I were going after the ball and our horses opened up to a full gallop. Our horses were competing, doing what they had been trained to do as if they’d been waiting for that moment all day. Here’s the video I promised. It’s all shot on my FlipCam with a few gorgeous stills shot by Fernando himself. A few more lessons and I could totally shoot video while riding a horse and hitting a small ball with a club.